Callaway, do you know who you are? You're the kid that had the coolest T-shirts in school. You're the kid that pierced their ear first. You're the kid that never came to school with lunch because you would always find some other kid and not beat them up, but talk them out of their PB&J, and they still wanted to be your friend afterward. You make sweet clubs, dude. Sweet clubs. Clubs that look tough. 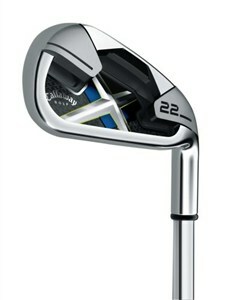 X-22 3 iron to pitching wedge -- and every one of them has this Marvel-Comic-looking cavity back to them. Tour-inspired head shape with a thinner top line and narrower sole, some crazy space-age "tru-bore" thing that dampens vibrations and simply "feels" cleaner, and you even won the Gold medal in the "game improvement" category from Golf Digest. I’ll admit that you are an upgrade from my old X18s. I tried you at a demo day at my local club along with your preppy friends like TaylorMade, Titleist, and Nike. Dangit, if you weren’t the longest and sweetest one of the lot. I am a 3 handicap and I found it very easy to work the ball with you. I hit two or three soft draws – some high and some low. I was able to flight the ball low with knock down shots, and fly the ball high and land soft with cut shots. Since then, I took you out a few times and have never had so much confidence with any other iron. I finally broke par for the first time! I’ve noticed that my shots are straighter and longer and that I am hitting all of my irons a half club longer. I used to hit my 7-iron around 155 to 165, now I hit it 170 on average. Your feel and forgiveness is what I most appreciate about you. (I could care less about your flashy good looks.) When I hit a ball out on your toe it still manages to head for the green. How do you do that? And when I hit one right in the middle of the clubface, you feel like soft butter and the ball flies low but spins when it hits the green and grabs. I hope you are not getting a big head! You know, Callaway, now I'm ticked at you. Sure, your clubs look cool and feel great -- and they do feel good to hit. Yes, I hit the ball pretty straight and true with you, but you know what? My friend Wilson did, too. And he doesn't demand as much of me as you do. You're spendy, Mr. Callaway. Sure, you can keep your crowds and tons of admirers. But I'm going to be strong and be friends with some other kids that don't cost as much. See you later, Callaway. I'm leaving. Right now. Unless... you're not busy and you want to hang out. Callaway? Are you busy? You want to do something, Callaway? I'm up for it. OK, cool. Let's play a quick nine.